LENZERHEIDE, Switzerland — Marcel Hirscher and Ted Ligety ensured the standout Austria and United States teams both emerged winners on a thrilling Saturday at Alpine skiing’s World Cup Finals. Hirscher scored enough points by finishing fourth in a dramatic giant slalom to clinch the sport’s most prestigious prize, the overall World Cup title, for a third straight season. Ligety, however, won the race and their duel for the season-long discipline trophy, which the Olympic champion lifted for a fifth time in the rare tiebreaker of most race victories. Still, it took an improbable scenario to force their points total tie. Ligety set his winning time by three-hundredths of a second, immediately before the last racer pushed Hirscher down a place by a single hundredth. That racer just happened to be Ligety’s best friend on tour, Felix Neureuther of Germany. “It’s an unbelievable happy day,” Hirscher said, even after watching Ligety and Neureuther roll around the finish-area snow in celebration. “My big goal was the overall World Cup title, and I got it and I’m so happy,” said Hirscher, the first man to win three in a row since American Phil Mahre in 1983. Before the men’s race instantly entered World Cup lore, Olympic champion Mikaela Shiffrin of the U.S. ended an exceptional slalom season in a class of her own. Two days after her 19th birthday, Shiffrin got her fifth World Cup win this season by a huge 1.44-second margin. Frida Hansdotter of Sweden was second and Olympic silver medalist Marlies Schild of Austria was third. Lifted by Shiffrin and Ligety at the Sochi Olympics, the U.S. team’s five-medal tally was topped only by Austria’s nine. Austria also ends the World Cup season ahead with a first overall title double for the Alpine nation since 2002. Hirscher’s third win followed Anna Fenninger clinching her first women’s title this week. Both come from villages near Salzburg and raced together as juniors 12 years ago when Stephan Eberharter and Michaela Dorfmeister were overall champions. The U.S. was the last nation to sweep the World Cup titles, in 2008, with Bode Miller and Lindsey Vonn. The American anthem played four times in quick succession on Saturday for 10,500 spectators at the Swiss venue — twice each for Ligety’s and Shiffrin’s race and season title victories. Ligety earned his crowd-pleasing, 100-point victory ahead of runner-up Alexis Pinturault of France, in a two-run combined time of 2 minutes, 15.63 seconds. He was 0.26 ahead of Neureuther. “I’m super-thrilled. 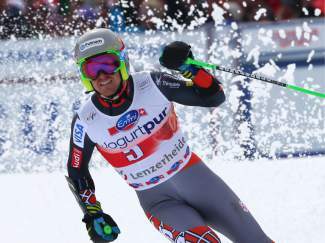 That was by the skin of my teeth today,” Ligety said. Relegated to fourth, Hirscher earned 10 fewer points and dropped into a tie with Ligety on 560 over the eight-race GS season. Ligety got the tiebreaker with five World Cup race wins against Hirscher’s two. “Felix, I owe a lot of beers,” Ligety said. U.S. men’s head coach Sasha Rearick hailed Neureuther as “a brother-in-law” of the team. “Felix has been training with us a lot over many, many years. To have him come in and help us like that was great,” Rearick said. They will renew their rivalry on Sunday for the season-long slalom title. “He is very mad about me so it’s going to be very close,” said Neureuther, who leads Hirscher by five points in the slalom standings. Henrik Kristoffersen of Norway is also in contention. Norway team leader Aksel Lund Svindal’s fading challenge for the overall ended by going out in the first run. He does not compete in slalom. Svindal had led Hirscher by 19 points, though all but conceded the title to him earlier this week. “It was a good season but it could have been fantastic,” said Svindal, who won the season titles in downhill and super-G.
Fenninger can add the GS title when completing her World Cup season on Sunday. The Austrian anthem will be heard at least twice, when Hirscher and Fenninger get their giant crystal globe trophies. It could be four.